Following years of excelling in the corporate workplace after receiving M.B.A. from Haas, UC Berkeley Business School, Maggie Huang decided it was time to switch gears and return to her first love - Interior Design. As a child, she'd spent hours with her mother perusing antique shops and market places, always keeping an eye out for unique pieces. As an adult, her corporate work in advertising, PR, and financial analysis allowed her to live in a wide array of locales such as Boston, San Francisco, Taiwan, Japan, Hong Kong and Singapore. This diverse range of life experiences has given her an appreciation for different styles and methods of art, and a unique perspective on interior styling. Interiors Awakened was founded as a culmination of this lifelong love for Interior Design, discovery of new arts, and interest in photography. These all contribute to the creation of flawless staging projects for the clients. Maggie is currently living in SF bay area with her family, one dog, and two chickens. 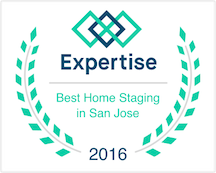 "Maggie did an amazing job staging my listing in Menlo Park earlier this year. She took an otherwise blank canvas and transformed it into a cool designer space. Everyone who came to the open houses raved about the staging and the home sold for almost 10% over asking! Maggie is a true professional. She was extremely communicative and timely and at the same time fun to work with. The furniture and decor is up to date and in great shape. I look forward to working with Maggie and Interiors Awakened on my next listing." "Maggie has staged many of my mid-century modern and Eichler listings perfectly. She has an eye for modern design and is very effective at integrating existing pieces with her designs. Clients love her and I would recommend her work to anyone. " " I am a designer/builder myself and the project which we hired Maggie for was the staging of my father in law's home for sale. She and her crew were fast, clean and respectful of our home. I believe that the overall impression of the house was greatly improved by the work which Maggie did and that the quick sale had to do with how well the house presented itself to the potential buyers. We had several offers within just the first few days the house was open to the public. Our prior attempt to sell the house, the year before, was not successful and I feel that the greatly improved first impression was a part of our quick sale. I was happy working with Maggie. It was a pleasant experience."